Under the auspices of The Latino Museum, Mexico City’s Philharmonic Orchestra debuts at Walt Disney Concert Hall performing an exquisite repertoire of master composers Carlos Chávez, Arturo Márquez, José Pablo Moncayo and Silvestre Revueltas. Led by Maestro Enrique Diemecke, Mexico’s Philharmonic will premiere Professor Steven Loza’s América Tropical—a piece interpreted by Los Ángeles Opera mezzo-soprano Suzanna Guzmán and accompanied by a narrative and multimedia imagery created by Professors Jose Luis Valenzuela and Judy Baca. The presentation will feature a Mariachi concerto by Los Camperos de Nati Cano and a narration for America Tropical by actor Edward James Olmos. The concert will give life to some of the greatest Mexican classical compositions from the twentieth century. Danzón, Huapango and La Noche de los Mayas exemplify the ability of their creators to fuse European, American and indigenous rhythmical, instrumental and compositional traditions—resulting in a uniquely Mexican modernist style. América Tropical is inspired by the educational and artistic work of muralist David Alfaro Siquieros in Los Angeles during the 1930s. The piece is a tone poem with narration embedded in a visual multimedia display of images of the art of Siqueiros and others—relating them to historical events in Mexican/Chicano Los Angeles. The multisensory presentation illustrates how such artistic movements influenced other sectors of the city and the world. Mexico City’s Philharmonic Orchestra occupies a very important place in Mexico’s rich musical life since the 1970s and it is regarded as one of the most prominent orchestras of Latin America. Its debut in Los Angeles closes a binational tour led by internationally acclaimed Maestro Enrique Diemecke featuring Los Angeles based Mariachi Los Camperos de Nati Cano. CONTACT: Ana Valenzuela, Pescador Communications and Associates, LLC. This project is based on an initiative to invite the Mexico City Philharmonic to Los Angeles under the auspices of UCLA and other community agencies and funding sources. We have secured the Walt Disney Hall for a performance of the group on Friday June 6 2008. The Mexico City Philharmonic has reserved the date for us. We are proposing to UCLA that the University act as the fiscal agent for this project. A) The concert will comprise classic compositions by Mexican composers of the twentieth century including Carlos Chávez, Silvestre Revueltas, José Pablo Moncayo, and Arturo Márquez. Also featured in the concert will be Los Angeles based Mariachi Los Camperos de Nati Cano, performing various pieces scored for orchestra and mariachi. B) We have also proposed a work (described below) to be commissioned and performed by the Mexico City Philharmonic as part of the Philharmonic’s presentations. The proposed newly commissioned performance piece will be based on the works of David Alfaro Siquieros, especially as related to his six-month period in the city of Los Angeles, noted for the “America Tropical” mural that he painted at an Olvera Street Bavarian brewery, and which was eventually whitewashed due to a biased segment of public demand. The proposed piece will take on the title of América Tropical, and will be composed as a mosaic of musical, theatric, and visual artistic interface. The principal theme will reflect on the thoughts and work of Siqueiros in conjunction with other historical Mexican and Chicano artists and writers. The piece will feature Los Angeles Opera mezzo soprano Suzanna Guzmán and actor-narrator Edward James Olmos. Both artists have been confirmed for the performance. 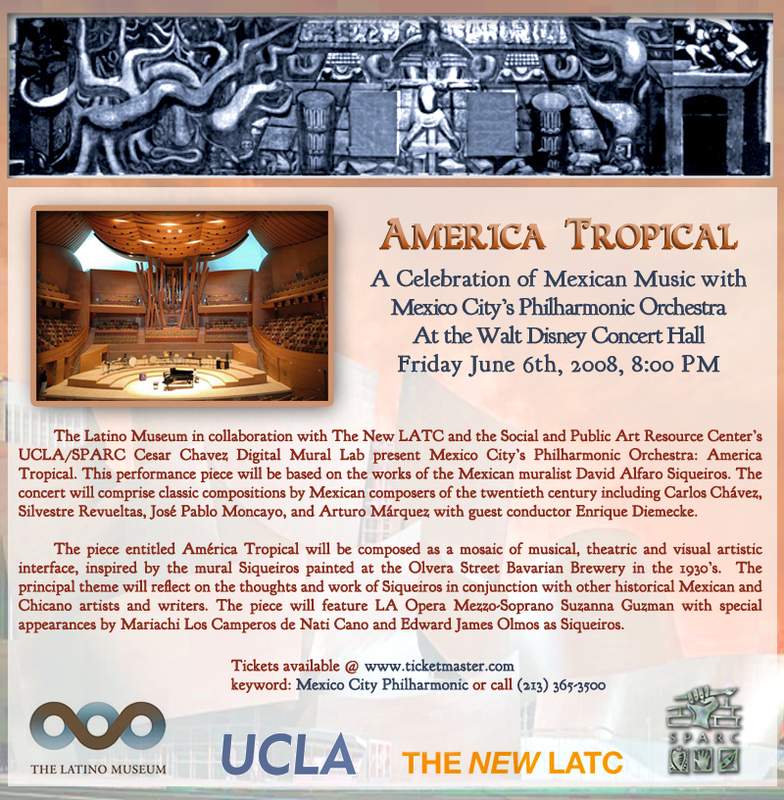 As already pointed out, in addition to the América Tropical piece, the Mexico City Philharmonic will also perform pieces by Carlos Chávez, Silvestre Revueltas, Arturo Márquez, and a mariachi concerto featuring Los Angeles based Mariachi Los Camperos de Nati Cano. The piece will comprise a tone poem with narration and/or acting within a visual multimedia display of images and projections of the art of Siqueiros and others as related to historical events in Mexican/Chicano Los Angeles, and the way that these artistic movements influenced other sectors of the city and the world. The piece will be created and produced by Steven Loza (musical score), José Luís Valenzuela (script and theater dimension), and Judy Baca (visual projections and/or visual art staging and design). Text for the piece (script, musical score) will be a collaboration of all of the latter three UCLA faculty/artists. Literary and other artistic references may include those of Octavio Paz, Carlos Fuentes, Luís Valdez, Carlos Chávez, Silvestre Revueltas, Carlos Pellicer, Juan Rulfo, José Vasconcelos, Diego Rivera, José Clemente Orozco, Juan O’Gorman, Luis Buñuel, Gabriel Figueroa, Emilio Fernández, Maria Félix, Pedro Infante, Anthony Quinn, Gronk, Willie Herrón, Patsy Valdez, Ruben Fuentes, José Alfredo Jiménez, Carlos Monsivais, Arturo Márquez, among others. As a young muralist I studied in the Taller Siqueiros and learned the Maestro’s techniques in polyangular theory along with his “punto” system for the musical division of space. His theories have been a seminal influence in my own work as a muralist and have transformed my own understandings of the differences between easel painting and mural painting. I am excited to be collaborating with my colleagues Steven Loza and Jose Luis Valenzuela to produce an integrated presentation of music, performance and a muralesque approach to visual art in Walt Disney Hall. I intend to use a multimedia presentation of visual images animated and projected to music and voice that exemplify Siquieros’ sophistication as the mural painter who best integrated painting into architecture and into the social conditions of a society. Through the use of LCD projections across multiple screens and the interior of the building and the use of images from our extensive archive on murals, we will make evident Siqueiros’ influence on muralism in the United States. His work “America Tropical,” painted in 1931 in Olvera Street, will be included within the imagery and its censorship in 1932 with white wash. America Tropical will emerge within the presentation through the white paint as it did in the 1970s, influencing Chicano muralism in Los Angeles. A series of digitally generated giant murals will be produced to transform the space and create the set for this production. The era of David Alfaro Siqueiros and his art is one that directly intersects the artistic experience of the Mexican American, or Chicano, community. The city of Los Angeles is especially germane to his legacy for several reasons, not the least that of the painter’s mural “America Tropical,” which has been both the source and topic of controversy since its conception and subsequent completion in 1931 on the wall of a Bavarian brewery at Olvera Street. Its whitewashing in 1932 at the hands of a reactionary, politically interested group of power brokers characterizes much of the power relations, especially in the expressive arts, of the Chicano context in the United States. Siqueiros himself, upon witnessing the artwork of California Chicanos in the media of muralism, theater, and music, recognized the virtues of early Chicano art in the 1960-70s. His denial for entry to the U.S., based on his political views, to work with the Chicano artistic community in Los Angeles again in the 1970s represents a lost artistic point of consolidation and interface with Mexico among young Chicano and non-Chicano artists. In the creative work that we propose herein, my goal as part of a team of three diverse artists is to adapt the motif of Siqueiros’ “America Tropical,” an image reflecting its indigenous juxtaposition of the mestizo human experiences of suppression, sacrifice, mysticism, and creativity. The Chicano/Latino experience throughout the U.S., and especially in Los Angeles, has been one of displacement, or perhaps better termed, that of an ignorance of its Mexican/Latin American heritage, and by extension, its legacy in the United States. Part of this complex issue lies in the fact that as a working class, discriminated sector of U.S. society, Latinos north of the Mexican-U.S. border learned little nor participated substantially in the culture of Mexican muralism, symphonic music, and theater-film-literature, and especially so in the period of the 1920s through the end of World War II; yet this was arguably the period of highest fermentation of these three artistic movements in Mexico, concretized through the works of artists such as the muralists David Alfaro Siqueiros, Diego Rivera, and Daniel Orozco, symphonic composers Manuel Ponce, Carlos Chávez, and Silvestre Revueltas, and writers and film makers such as Luis Buñuel, Emilio Fernández, Gabriel Figueroa, Juan Rulfo, Carlos Pellicer, and Jose Vasconcelos, the latter who also served as Minister of Education and who commissioned many of the aforementioned artists. With the Chicano movement and its related artistic movement, Chicano artists, reacting to a cultural ignorance that largely resulted form hegemonic educational contexts in the U.S., began to identify heavily with their Mexican heritage and its various artistic forms in visual art, music, dance, film, and theater, in addition to literary expression, e.g., the works of Mexicans Octavio Paz, Carlos Fuentes, Chicanos Luís Valdez and Alurista, and a diversity of Latin American writers, poets, and political essayists such as Pablo Neruda, Roberto Fernández Retamar, Gabriel Márquez, among many others. My contribution to the creative piece we propose here, America Tropical, will be based on both the historical referents I have cited above in addition to a theme inspired by the contemporary corpus of Chicano artists attempting to conserve and evolve within the rich frameworks of past Mexican artists. I will compose a tone poem to be synchronized with the interpretations of my two colleagues – the digitally projected images constructed by Judy Baca and the dramatic narrative written and directed by José Luís Valenzuela. I am very excited about this project, America Tropical, based on the legacy of David Alfaro Siqueiros, and I consider it as one of the more challenging opportunities of my career in the arts. I am planning to work closely with both Professors Baca and Loza in formulating my theatrical dimension to the piece. We have met as a group, and I plan to tap into Professor Baca’s prolific knowledge of Siqueiros’ artistic philosophy and writings on the subject, especially that of his polyangular theories. I am also conducting my own research on Siqueiros, especially as related to his perspectives on other art forms including music, dance, theater, architecture, poetry, and prose. Professor Loza has discussed with us that he would like to adapt a “polyphonic” and “polyrhythmic” concept to this in addition to indigenous and mestizo musical forms. I would like to add to this matrix by developing a “poly-dialogue” of thematic monologue by Siqueiros, (represented and narrated by a principal actor) based on his own written ideas, juxtaposed with a multiplicity of other voices (two or three other actors/performers). I am considering some strategic use of melodic voice in conjunction with Professor Loza’s musical score, in addition to close interaction with his music and the visual montage developed by Professor Baca. In conjunction with the ideas developed by Professors Baca and Loza, I will write and direct a script that takes the form of a play within a larger multimedia canvas or “living mural” inspired by the monumental “América Tropical” mural and the art of Siqueiros and his legacy within the sphere of Mexican, Chicano, and American artistic life. The Mexico City Philharmonic Orchestra (Orquesta filarmonica de la Ciudad de México) performed for the first time on September 15, 1978. Since that day it has occupied a very important place in Mexico’s rich musical life, soon achieving an excellent artistic capacity and becoming one of the most prominent orchestras of Latin America. The personal profile of the Orchestra has always been international. Approximately one half of its members are Mexicans. The other half consists of musicians of the following nations: argentina, Armenia, Bulgaria, France, Germany, Peru, Poland, Rumania, Russia, Ukraine, and the U.S.A. Many non-Mexican members are also involved as teachers in educational institutions for music in Mexico city and other cities. This is their contribution to the development of the Mexican musical environment. The Orchestra’s numerous activities are not limited to concert seasons. They also embrace didactic and social fields: regular educational concerts for children and adults, visiting sites that have little or no opportunity of listening to classical music, frequent concerts in all main cities of the Mexican Republic, and participation in national events. The Orchestra has recorded a collection of works of Mexican composers (30 discs), 25 discs of classical music and several discs of popular and movie music. Invited soloists have included Leonard Bernstein, Eduardo Mata, Stanislaw Skrowaczewski, Janos Starker, Claudio Arrau, Placido Domingo, and Jorge Federico Osorio. The Orchestra has had five music directors since its inception: Fernando Lozano, Enrique Bátiz, Luís Herrera de la Fuente, Jorge Mester, and the current Enrique Barrios. She was the first recipient of the Plácido Domingo Award in 1997, won a nomination for a Helen Hayes Outstanding Lead Actress Award for her portrayal of the Mother in Menotti’s AMAHL AND THE NIGHT VISITORS, was one of the Miller Company’s 1998 Twelve Outstanding Latinos in Music in America and spotlighted by PEOPLE MAGAZINE in their Silver Millennium Issue as a “triunfadora”. She was a National Finalist in the Metropolitan Opera Competition in 1985, as well as first place in the San Francisco Opera, Guild Opera, Center for Contemporary Opera. Professor of ethnomusicology at UCLA, where he has been on the faculty for twenty-three years, and adjunct professor of music at the University of New Mexico, where he formerly directed the Arts of the Americas Institute. He has conducted extensive research in Mexico, the Chicano/Latino U.S., Cuba, among other areas, and has lectured and read papers throughout the Americas, Europe, and Asia. He has been the recipient of Fulbright and Ford Foundation grants among numerous others, and has served on the national screening and voting committees of the Grammy Awards for fifteen years. Aside from UCLA and the University of New Mexico, he has taught at the University of Chile, Kanda University of International Studies in Japan, and the Centro Nacional de las Artes in Mexico City. His publications include two books, Barrio Rhythm: Mexican American Music in Los Angeles (1993) and Tito Puente and the Making of Latiin Music (1999), both published by the University of Illinois Press, in addition to four anthologies, Musical Aesthetics and Multiculturalism in Los Angeles (UCLA Ethnomusicology Publications), Musical Cultures of Latin America: Global Effects, Past and Present (UCLA Ethnomusicology Publications, 2003), Hacia una musicología global: pensamientos sobre la etnomusicología (CENIDIM/CONACULTA, Mexico, in press), and Religion as Art: Guadalupe, Orishas, Sufi (University of New Mexico Press, in press). Loza has performed a great amount of jazz and Latin jazz, has recorded two CDs, and has produced numerous concerts and arts festivals internationally, including his role as director of the UCLA Mexican Arts Series from 1986-96 and co-director of the Festival de Músicas del Mundo in Mexico City in 2000. Since 1976, Judith F. Baca has served as the Founder/Artistic Director of the Social and Public Art Resource Center (SPARC) in Venice, California. She has taught studio art as a Professor of Fine Arts for the University of California since 1980. As of 1996, she concurrently holds two academic appointments: as Vice Chair of UCLA’s Cesar Chavez Center and as Professor of Art for World Arts and Cultures at UCLA. As a visual artist and one of the nation’s leading muralists, Judith F. Baca is best known for her large-scale public art works. In her internationally-known The Great Wall of Los Angeles, a landmark pictorial representation of the history of ethnic peoples of California from their origins to the 1950’s, Baca and her planning and painting teams of approximately 700 participants produced 2,435 running feet of murals in segments over seven summers, from 1976 to 1984. The Great Wall engaged over 400 young people, 14-21 years of age, of diverse cultural and economic backgrounds. Working with scholars, oral historians, local artists and hundreds of community members, it is one of the most acclaimed monumental cultural projects in the United States dealing with interracial relations. It provides a vibrant and lasting tribute to California and the unrecognized ethnic groups who have shaped this state’s history. Its half-mile length in the Tujunga wash drainage canal and its accompanying bike trails and park in the San Fernando Valley hosts thousands of visitors every year. Restoration of the older elements of The Great Wall, along with the research and design for its continuance into the 1990’s is currently underway. Baca founded the first City of Los Angeles mural program in 1974. It produced over 400 murals and employed thousands of local participants during its ten years of operation. In 1976, she founded the Social and Public Art Resource Center (SPARC) in Venice, California, where she still serves as the Artistic Director. In 1988 at the request of Mayor Tom Bradley, she developed a new city mural program based on the previous successful model of The Great Wall of Los Angeles. This program, entitled Great Walls Unlimited: Neighborhood Pride Program, has produced over 85 murals in almost every ethnic community in Los Angeles. It has provided training for hundreds of artists and youth, making it one of the country’s most respected mural education programs. Baca has exhibited nationally and internationally. Her work appears in the museum collections of the National Museum of American Art at the Smithsonian and at the Wadsworth Antheneum in Hartford, Connecticut. The core of both her public and personal work is based on the belief that art is a tool for social change and self-transformation, capable of fostering civic dialogue in the most uncivil places. Professor of Theater at the School of Theater, Film and Television at UCLA. Valenzuela has directed at several prestigious regional venues including the Los Angeles Theater Center where he developed the Latino Theater Lab; El Teatro de la Esperanza; Mark Taper Forum and Teatro Jorge Negrete where his production of Hijos won Drama-Logue Awards for Best Direction, Ensemble and Actor. His international theater directing credits include Henrik Ibsen’s Peer Gynt at the Norland Theatre in Norway and Manuel Puig’s Kiss of the Spider Woman at the National Theatre of Norway. He serves as the Artistic Director of the Latino Theater Company in Los Angeles, a group of artists committed to creating and producing new works that examine in bold contemporary terms the Latino/a experience in the United States. He directed the play and feature film Luminarias, that challenged Latina stereotypes. The film starred Cheech Marín, Scott Bakula and Lupe Ontiveros. Valenzuela directed the world premiere of Dementia, written by Evelina Fernandez, for the Latino Theater Initiative. The play was the first of its kind to tackle the HIV/AIDS issue in the Latino community and won the 2003 GLAAD Award for Outstanding Theater Production in Los Angeles. He was honored with the 2003 Hispanic Heritage Month Local Hero of the Year Award recognizing distinguished citizens for contributions to improving the quality of life in their communities.